If you’re staying in Marbella Town and don’t have a car or don’t fancy the relatively long walk from the town centre to reach the fine-sanded expanse of beach known as Banana Beach, some 700 metres to the east of the fishing port, an alternative way of spending a few hours enjoying this lovely stretch of coastline is to pack up your beach gear in a rucksack, rent a bike and cycle there. Having done this route previously on my own regular bicycle, I thought it would be a good opportunity to test it out on an e-bike for comparison purposes and rented one for the morning. For those of you who have never heard of an e-bike, it’s basically a regular bicycle with an electrically-charged battery-powered motor that allows you to pedal along normally and activate the motor when going uphill, or if your legs are tired or you don’t want to work up a sweat, you can use the motor throughout your cycle ride. 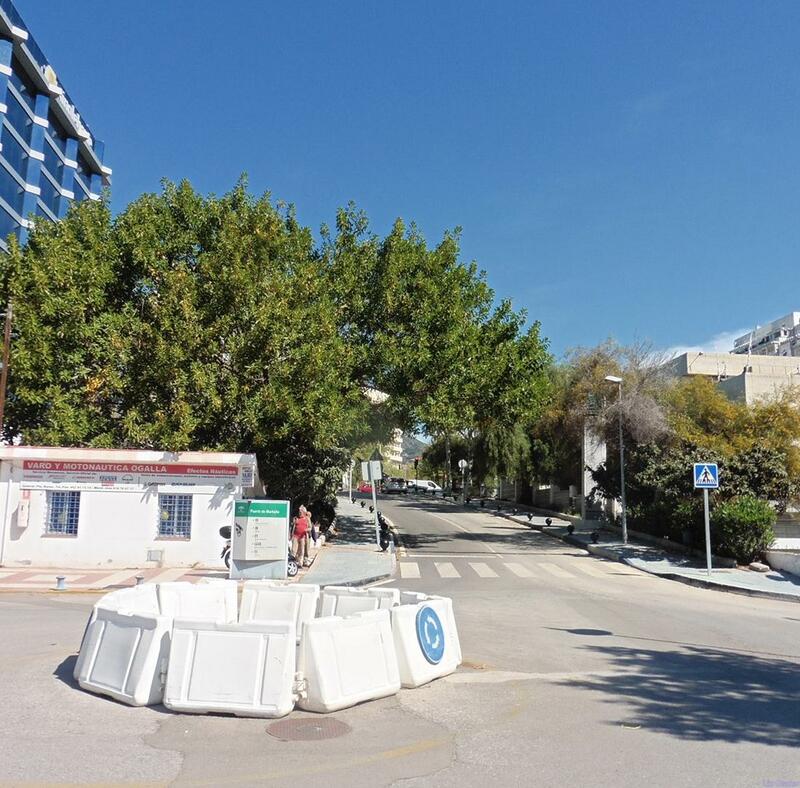 On the morning I rented the e-bike, I headed east from Marbella’s Leisure Harbour to Bar Los Pescadores in the fishing port first, for a coffee and a catch-up with the friends I’ve made there over the months and then cycled back to the roundabout at the entrance to the port. To get to Marbella’s Banana Beach, there´s no other option but to cycle straight up the hill from here to the main road (which on the e-bike was a joy) and when you reach the top, you turn left and can either cycle along the slip road (but you must wear a helmet if you do) or pavement- hop past the various car showrooms that line this section of the road. 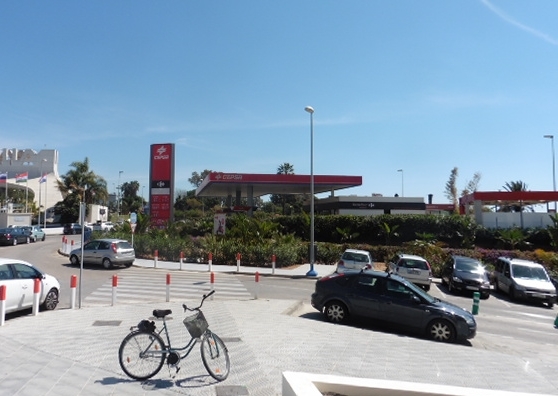 When you reach the Cepsa petrol station just by Marbella’s entrance archway, there´s as steep road to the right leading down to the start of Banana Beach. As well as being a lovely unspoilt expanse of beach, popular with the locals but that doesn’t get too crowded even in the summer months because of its width, the plus factor to this bike ride is that you can get a taste of what’s to come by cycling east along the stretch of completed wooden walkway that forms part of the Coastal Path Project which aims to link Malaga province’s 180km stretch of coastline from Nerja to Manilva. After just under 1 km, the path continues upwards but stops at the motorway, so I would suggest you just turn back on yourself when you reach the end of the flat stretch. 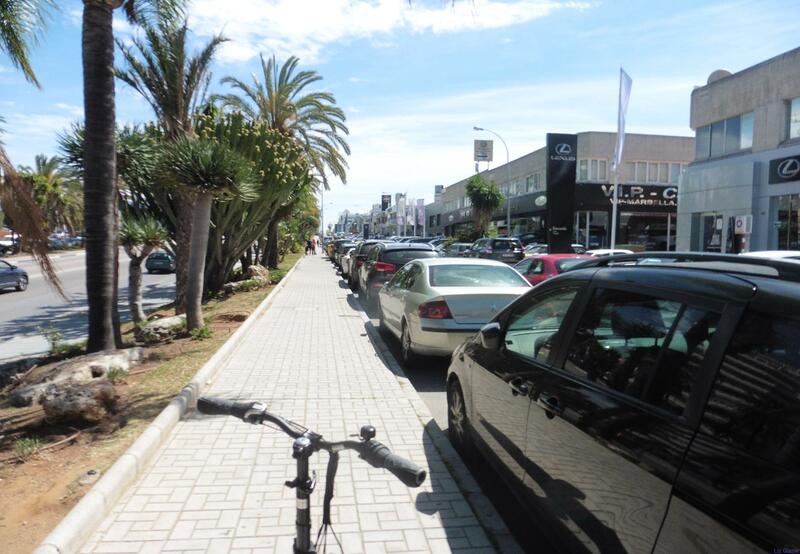 There’s something inexplicably thrilling about cycling on the path’s wooden surface flanked by shrubs and trees with the dunes and sea beyond and it gives you a glimpse of what Marbella’s coastline must have been like before the property boom. 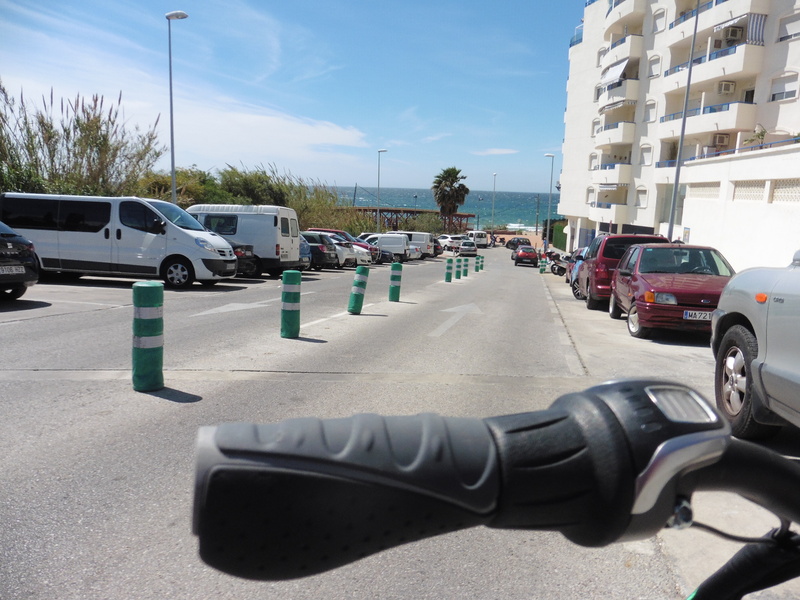 There are various exit ramps along the way opening onto the beach where you can secure your bike to a post and stroll along the shore, have a dip in the sea and sunbathe amid the dunes. On the way back on this particular occasion, I was cycling against the wind and it was here that I again appreciated the contrast of being on an e-bike instead of my regular bicycle, as the extra boost the e-bike provided made it all so easy. Although I’d run out of time due to my earlier stop-off at the fishing port, when I am down this way, I tend to have a coffee or a snack at a beach bar which is located just below the start of the stretch of wooden path called La Dolce Vita, before heading back to Marbella Town. If you’ve not cycled for a while or particularly on a hot sunny day, I would definitely recommend you rent an e-bike to reach this beach for the sheer ease factor. Great blog! I had no idea that walkway was there so I will definitely be taking a walk down there. 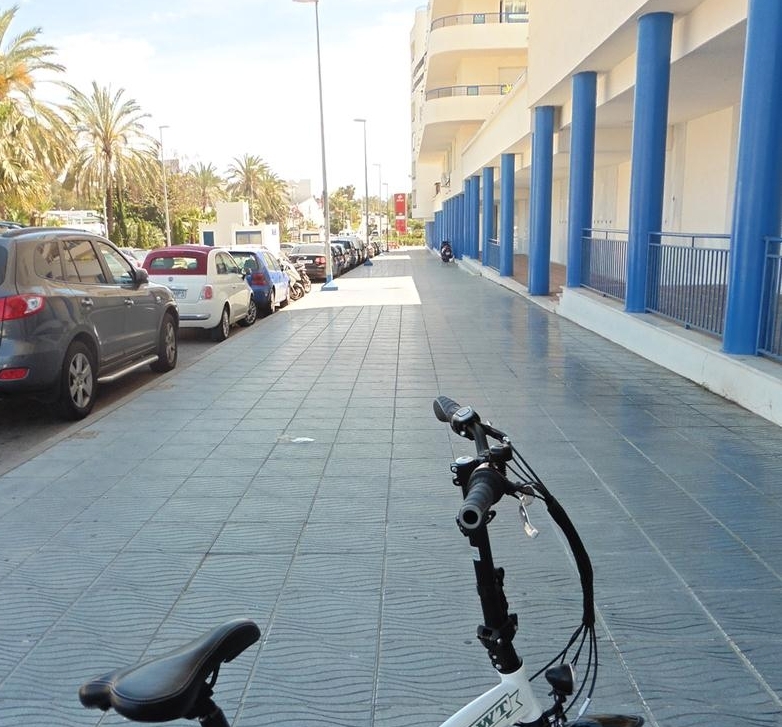 It´s a lovely walk along the beach from the fishing port but cycling there is a great option too – apparently there is a lovely longer stretch of walkway running east from Cabopino to Mijas Pueblo which must be fabulous. Great blog, love the info, love e-bikes! Great info! 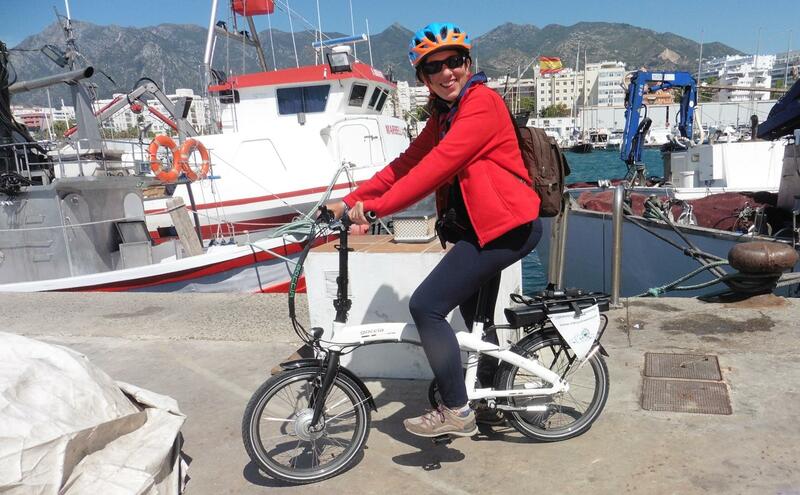 Love the blog, love e-biking! It’s a fabulous cycle, particularly on an e-bike! What a lovely ride – lets do it next time I visit. Yes it is indeed – that would be lovely! Great blog and new information about Marbella!!!! Thank you Ruth! More to come soon!